Mansfield City Hall is located at 30 North Diamond Street, Mansfield, OH 44902; phone: 419-755-9711. Photo: Rufus A. Kern House, ca. 1920, 608 Park Avenue West, Mansfield, OH. Listed on the National Register of Historic Places in 1983. Photographed by User:Smallbones (own work), 2011, [cc-by-1.0 (creativecommons.org/publicdomain/zero/1.0/deed.en)], via Wikimedia Commons, accessed January, 2015. Mansfield, seat of Richland County, covers the top and the sides of a ridge encircled by the last foothills of the Appalachian Mountains in north-central Ohio. The city in the foothills is seen to best advantage from Ashland Hill (US 42), across the valley of Rocky Fork. From the hill it appears as a matted carpet of housetops interwoven with green strands of tree-lined streets. The courthouse spire and the dominating cluster of buildings on the gentle crest of the ridge seem very tall; by contrast the other buildings are subdued to splashes of white and red among the trees. Prominent on the high bank overlooking the river are the huge red brick factories of Westinghouse and Ohio Brass; close by are the Tappan Stove and Mansfield Tire and Rubber plants. To the southeast the valley extends a far-flung panorama of gardens and good farm lands with neat houses and barns. From the valley floor, red brick streets wind past the river, through the industrial city and the old Flats district, and up to the public square. Off to the west and southwest along Park and Lexington Avenues are the trim new houses with carefully groomed lawns. The public square, neither too large nor too small and made intimate by its walks, trees, bandstand, and benches, is in the center of Mansfield's business life. Day and night it is surrounded with cars parked head-in, and across it go a steady stream of pedestrians to the stores and offices. A venerable red brick courthouse sits facing the square from the east; and on the west a statue of a Civil War soldier (painted blue with gold trimming) faces the setting sun up Park Avenue west between the two Mansfield 'skyscrapers.' Modern structures, old buildings with modernistic fronts, and movie palaces mingle with the unaltered dingy houses of the Victorian era. Within neighborly distance of the square are the occasional proud, spacious houses of yesterday. 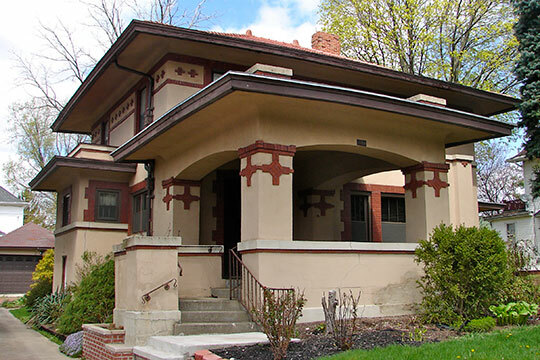 In this blend of the modern and the outmoded, the industrial and the traditional, the small home of the workman and the mansion of the retired farmer or the active industrialist, Mansfield finds its distinctive flavor. Within two hours' drive of Cleveland, Akron, Toledo, and Columbus, it has added to its small industrial and farm-center complexion the more modish shades of the metropolitan areas. Smart shops embellish the business section; the new residential developments, especially in the Woodland's area (here the famed House of Tomorrow with the electric-eye servants was displayed in 1934), are symbols of Mansfield's prosperity and urban flare. The city was named for Jared Mansfield, Surveyor General of the United States, under whose direction the site was laid out in 1808. During the first winter, Samuel Martin, itinerant trader, put up a cabin on the northwest corner of the square. His stay proved temporary when he was discovered selling whisky to the Indians. Soon his cabin was reoccupied by James Cunningham, the first permanent settler, and the town was born. Extinction threatened the settlers during the War of 1812. Learning of the approach of raiding Indian allies of the British, Johnny Appleseed (John Chapman) sped 30 miles to bring up troops from Mount Vernon, thus forestalling tragedy. Presently a contingent of 2,000 men under General Crooks arrived and aided the settlers in clearing more than 50 acres of the wilderness within the town limits. Later, two blockhouses were built in the public square, their garrisons remaining until near the end of the War of 1812. One of these blockhouses, which for a time served as courthouse and jail, still stands in Mansfield's South Park, to which it was removed in 1905. During the War of 1812, Richland County completed its organization and chose Mansfield as its seat, but it was not until after the war that the first courthouse was built, a hewn log structure. The growth of Mansfield was gradual, the village thriving as the farm lands of Richland County were cleared of timber and put under cultivation. While still a hamlet, Mansfield had its first newspaper, The Olive (1817), and within two years a bake shop and a brewery were opened, the latter under the picturesque name, The Devil's Teapot. When the canal-boom hysteria was sweeping Ohio, Mansfield was still a village of a few hundred people. Away from any watercourses that might induce the building of a canal route through it, the village escaped the madness of inflated real estate but it also missed the surge of waterway prosperity. In the 1840s the town experienced the most rapid growth in its history. When the first train of the Mansfield and Sandusky Railroad chugged into town in 1846, it opened up an outlet to a lake port, although the schedule was an erratic one. By 1850 a substantial bank had been established, telegraph poles set up on the village streets, and tracks laid for the Pittsburgh, Fort Wayne and Chicago Railroad. Meanwhile the town's citizens were active in the political field; in 1844, the year John Sherman began his law practice in the village, Mansfield's Thomas Bartley succeeded to the governorship of the State on the resignation of Governor Thomas Corwin. In turn he was succeeded by his father, Mordecai Bartley. Sherman, the brother of General William Tecumseh Sherman, was elected to Congress in 1855, beginning a brilliant career in National politics, during which he wrote and obtained enactment of the Sherman Anti-Trust Act. Too, the industrial hum was beginning to harmonize its tones with the creak of the farm wagons. At night were secret activities, for at Mansfield routes of the Underground Railroad for runaway slaves crossed. The endorsement of Abraham Lincoln for President in 1858 by the newly formed Richland County Lincoln Society brought out the first group pressure behind Lincoln for that office. In the trying Civil War period, John Sherman was a bulwark in the Nation's financial policy, sharing with his brother, William, after the 'March to the Sea,' probably the most talked-of name in Ohio. Proximity to natural resources favored the steady progress of Mansfield after the Civil War. Its rate of increase was more or less regular. Manufacturing accounted for the growth; the first major industry was the firm of Aultman and Taylor, which became one of the largest makers of threshing machines and allied products in the country. By 1880 the population approached the 10,000 mark, and the 'talking wire' was being hung around the square. The State located the Ohio State Reformatory in Mansfield in 1885. Three years later the Ohio Brass Company, which in 50 years has become a basic Mansfield institution, was founded. By 1900 nearly 18,000 people lived in the city. In this period, while the steel makers and other heavy industries were being overwhelmed by tidal waves of mid-European immigrants, Mansfield retained the racial characteristics of its early settlers. The World War decade with its demand for iron and steel products heightened the prosperity of the city. The Empire Sheet and Tin Plate Company began operations in time to be carried forward by the momentum of war-material fabrication. Further diversification of manufacture improved the condition of the city; the Mansfield Tire and Rubber Company, the Tappan Stove Company, and a plant of the Westinghouse Electric and Manufacturing Company added their stimuli. The Ohio Brass Company expanded. By 1920 Mansfield was a city of 27,824 people. Those super-prosperous years after the World War found Mansfield still growing but in its own unhurried tempo. An open-hearth furnace and a bar mill were added to the steel plant. The American Red Cross focused attention on the city with its first demonstration of child-health practice. Proudly the citizens erected a new municipal building and a new high school, 'the best in the state,' and the 'skyscrapers' reached upward to the hilltops. Meanwhile the world was learning of Mansfield through the novels of one of its sons, Louis Bromfield, Pulitzer Prize winner. The Green Bay Tree, Possession, Early Autumn, and, later, The Farm, vivify for the reader the Mansfield of Bromfield's earlier years as a native here, the years in which the iron-fenced mansions were a world apart to the boy from "across the tracks." Never getting Mansfield out of his system, Bromfield returned in 1939, after 14 years of residence in France, to purchase a Richland County farm. Paradoxically, the city that never had known a boom experienced one while the rest of the world was languishing in the economic doldrums of the 1930s. The quick upsurge of the new electrical era, making commonplaces of electrical gadgets, resulted in Westinghouse's hiring upward of 5,000 workers. In the middle of the depression, Mansfield employed 9,000 men and women in producing $85,000,000 worth of products. And an additional byproduct of this expansion was the stimulation in the construction of individual homes, Mansfield showing the way in number of units constructed to many a larger city. Today Mansfield still grows, a city of increasing substance in essential manufactures, stretching out over the valley and up to the higher lands in its path. The Richland County Fair remains an annual event, a 90-year-old reminder of the agricultural background of the community. Soundly located and favorably situated on a network of first-class highways, Mansfield is a good Midwestern town, living a well-rounded life. Workers of the Writer's Program of the Works Progress Administration in the State of Ohio, The Ohio Guide, The Ohio State Archaeological and Historical Society, 1940.